Bangkok Wolves: 1st Post - Welcome to "Bangkok Wolves" 5-a-Side Futsal Soccer Team - It's Alive!!!! 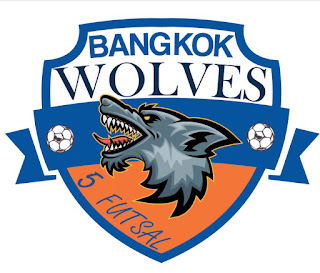 1st Post - Welcome to "Bangkok Wolves" 5-a-Side Futsal Soccer Team - It's Alive!!!! Anyway, we are ALIVE and already played a couple practice matches against the Thai University team at their Home Practice Pitch at Rajamangala University of Technology Krungthep (UTK) - Bangkok. Their home "Pitch" is located near Empire Tower (Webster University's home offices), yet the "PRO" Wolves have their official first Game scheduled for 29 September 2018 at another field in Bangkok. p.s. The Wolves main sponsor is the HiHelloBKK.com B2B entity, yet they are open to NO more than 4 other corporate sponsors. Drop us a message here to learn more. Stay Happy - Stay Healthy Bangkok!!! "Bangkok Wolves" International Trademark Declared - yet Use it (With Our Permission Please)!! !